0093 - Teva Pharmaceuticals Usa Inc.
Diclofenac Epolamine with NDC 0093-3225 is a a human prescription drug product labeled by Teva Pharmaceuticals Usa Inc.. The generic name of Diclofenac Epolamine is diclofenac epolamine. The product's dosage form is patch and is administered via topical form. Labeler Name: Teva Pharmaceuticals Usa Inc.
Renal ToxicityLong-term administration of NSAIDs has resulted in renal papillary necrosis and other renal injury.Renal toxicity has also been seen in patients in whom renal prostaglandins have a compensatory role in the maintenance of renal perfusion. In these patients, administration of an NSAID may cause a dose-dependent reduction in prostaglandin formation and, secondarily, in renal blood flow, which may precipitate overt renal decompensation. Patients at greatest risk of this reaction are those with impaired renal function, dehydration, hypovolemia, heart failure, liver dysfunction, those taking diuretics and ACE inhibitors or ARBs, and the elderly. 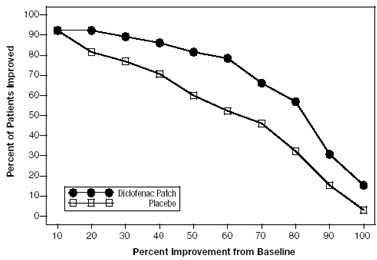 Discontinuation of NSAID therapy is usually followed by recovery to the pretreatment state.No information is available from controlled clinical studies regarding the use of DICLOFENAC EPOLAMINE TOPICAL PATCH 1.3% in patients with advanced renal disease. 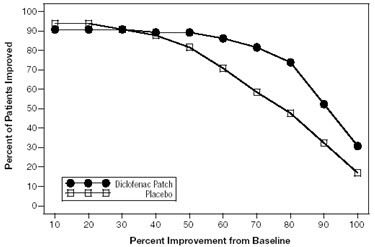 The renal effects of DICLOFENAC EPOLAMINE TOPICAL PATCH 1.3% may hasten the progression of renal dysfunction in patients with pre-existing renal disease.Correct volume status in dehydrated or hypovolemic patients prior to initiating FLECTOR PATCH. Monitor renal function in patients with renal or hepatic impairment, heart failure, dehydration, or hypovolemia during use of DICLOFENAC EPOLAMINE TOPICAL PATCH 1.3% [see Drug Interactions (7)]. Avoid the use of DICLOFENAC EPOLAMINE TOPICAL PATCH 1.3% in patients with advanced renal disease unless the benefits are expected to outweigh the risk of worsening renal function. If DICLOFENAC EPOLAMINE TOPICAL PATCH 1.3% is used in patients with advanced renal disease, monitor patients for signs of worsening renal function. Localized ReactionsOverall, the most common adverse events associated with DICLOFENAC EPOLAMINE TOPICAL PATCH 1.3% treatment were skin reactions at the site of treatment. Table 1 lists all adverse events, regardless of causality, occurring in ≥ 1% of patients in controlled trials of FLECTOR PATCH. 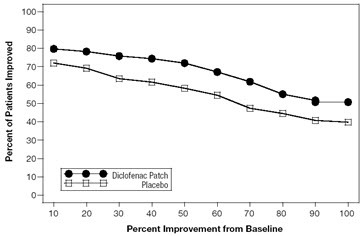 A majority of patients treated with DICLOFENAC EPOLAMINE TOPICAL PATCH 1.3% had adverse events with a maximum intensity of "mild" or "moderate. "Table 1. Common Adverse Events (by body system and preferred term) in ≥ 1% of Patients treated with DICLOFENAC EPOLAMINE TOPICAL PATCH 1.3% or Placebo Patch The table lists adverse events occurring in placebo-treated patients because the placebo-patch was comprised of the same ingredients as DICLOFENAC EPOLAMINE TOPICAL PATCH 1.3% except for diclofenac. Adverse events in the placebo group may therefore reflect effects of the non-active ingredients.CategoryDiclofenacN=572Placebo N=564NPercentNPercentApplication Site Conditions 64117012 Pruritus315448 Dermatitis923<1 Burning2<181 OtherIncludes: application site dryness, irritation, erythema, atrophy, discoloration, hyperhidriosis, and vesicles.224153Gastrointestinal Disorders499336 Nausea173112 Dysgeusia1023<1 Dyspepsia7181 OtherIncludes: gastritis, vomiting, diarrhea, constipation, upper abdominal pain, and dry mouth.153112Nervous System Disorders 132183 Headache71102 Paresthesia6181 Somnolence4161 Other Includes: hypoesthesia, dizziness, and hyperkinesias.413<1Foreign labeling describes that dermal allergic reactions may occur with DICLOFENAC EPOLAMINE TOPICAL PATCH 1.3% treatment. Additionally, the treated area may become irritated or develop itching, erythema, edema, vesicles, or abnormal sensation. Risk SummaryPublished literature reports that use of NSAIDs, including DICLOFENAC EPOLAMINE TOPICAL PATCH 1.3%, after 30 weeks' gestation increases the risk of premature closure of the fetal ductus arteriosus. Data from observational studies regarding potential embryofetal risks of NSAID use, including diclofenac, in women in the first or second trimester of pregnancy are inconclusive. Avoid use of NSAIDs, including DICLOFENAC EPOLAMINE TOPICAL PATCH 1.3%, in pregnant women starting at 30 weeks of gestation (third trimester) (see Clinical Considerations and Data).In animal reproduction studies, diclofenac epolamine administered orally to pregnant rats and rabbits during the period of organogenesis produced embryotoxicity at approximately 3 and 7 times, respectively, the topical exposure from the maximum recommended human dose (MRHD) of FLECTOR PATCH. In rats, increased incidences of skeletal anomalies and maternal toxicity were also observed at this dose. Diclofenac epolamine administered orally to both male and female rats prior to mating and throughout the mating period, and during gestation and lactation in females produced embryotoxicity at doses approximately 3 and 7 times, respectively, the topical exposure from the MRHD (see Data). Based on animal data, prostaglandins have been shown to have an important role in endometrial vascular permeability, blastocyst implantation, and decidualization. In animal studies, administration of prostaglandin synthesis inhibitors such as diclofenac, resulted in increased pre- and post-implantation loss.The estimated background risk of major birth defects and miscarriage for the indicated population is unknown. All pregnancies have a background risk of birth defect, loss, or other adverse outcomes. In the U.S. general population, the estimated background risk of major birth defects and miscarriage in clinically recognized pregnancies is 2-4% and 15-20%, respectively. AbsorptionFollowing a single application of the DICLOFENAC EPOLAMINE TOPICAL PATCH 1.3% on the upper inner arm, peak plasma concentrations of diclofenac (range 0.7 – 6 ng/mL) were noted between 10 – 20 hours of application. Plasma concentrations of diclofenac in the range of 1.3 – 8.8 ng/mL were noted after five days with twice-a-day DICLOFENAC EPOLAMINE TOPICAL PATCH 1.3% application.Systemic exposure (AUC) and maximum plasma concentrations of diclofenac, after repeated dosing for four days with, DICLOFENAC EPOLAMINE TOPICAL PATCH 1.3% were lower (<1%) than after a single oral 50-mg diclofenac sodium tablet.The pharmacokinetics of DICLOFENAC EPOLAMINE TOPICAL PATCH 1.3% has been tested in healthy volunteers at rest or undergoing moderate exercise (cycling 20 min/h for 12 h at a mean HR of 100.3 bpm). No clinically relevant differences in systemic absorption were observed, with peak plasma concentrations in the range of 2.2 – 8.1 ng/mL while resting, and 2.7 – 7.2 ng/mL during exercise. Special Application InstructionsInstruct patients that, if DICLOFENAC EPOLAMINE TOPICAL PATCH 1.3% begins to peel-off, the edges of the patch may be taped down. If problems with adhesion persist, patients may overlay the patch with a mesh netting sleeve, where appropriate (e.g. to secure patches applied to ankles, knees, or elbows). The mesh netting sleeve (e.g. Curad® Hold Tite™, Surgilast® Tubular Elastic Dressing) must allow air to pass through and not be occlusive (non-breathable). Instruct patients not to apply DICLOFENAC EPOLAMINE TOPICAL PATCH 1.3% to non-intact or damaged skin resulting from any etiology e.g. exudative dermatitis, eczema, infected lesion, burns or wounds. Instruct patients not to wear a DICLOFENAC EPOLAMINE TOPICAL PATCH 1.3% when bathing or showering.Instruct patients to wash hands after applying, handling or removing the patch. Diclofenac Epolamine Patch 1.3 % (10 × 14 cm) containing 180 mg of diclofenac epolamine, embossed with DICLOFENAC EPOLAMINE TOPICAL PATCH 1.3% TEVA 3225. Anemia has occurred in NSAID-treated patients. This may be due to occult or gross blood loss, fluid retention, or an incompletely described effect on erythropoiesis. If a patient treated with DICLOFENAC EPOLAMINE TOPICAL PATCH 1.3% has any signs or symptoms of anemia, monitor hemoglobin or hematocrit.NSAIDs, including, DICLOFENAC EPOLAMINE TOPICAL PATCH 1.3% may increase the risk of bleeding events. Co-morbid conditions such as coagulation disorders, concomitant use of warfarin, other anticoagulants, antiplatelet agents (e.g., aspirin), serotonin reuptake inhibitors (SSRIs) and serotonin norepinephrine reuptake inhibitors (SNRIs) may increase this risk. Monitor these patients for signs of bleeding [see Drug Interactions (7)]. Even a used DICLOFENAC EPOLAMINE TOPICAL PATCH 1.3% contains a large amount of diclofenac epolamine (as much as 170 mg). The potential therefore exists for a small child or pet to suffer serious adverse effects from chewing or ingesting a new or used. DICLOFENAC EPOLAMINE TOPICAL PATCH 1.3% It is important for patients to store and dispose of DICLOFENAC EPOLAMINE TOPICAL PATCH 1.3% out of the reach of children and pets. Because clinical trials are conducted under widely varying conditions, adverse reaction rates observed in the clinical trials of a drug cannot be directly compared with rates in the clinical trials of another drug and may not reflect the rates observed in practice.In controlled trials during the premarketing development of DICLOFENAC EPOLAMINE TOPICAL PATCH 1.3% , approximately 600 patients with minor sprains, strains, and contusions were treated with DICLOFENAC EPOLAMINE TOPICAL PATCH 1.3% for up to two weeks. See Table 2 for clinically significant drug interactions with diclofenac.Table 2: Clinically Significant Drug Interactions with DiclofenacDrugs That Interfere with HemostasisClinical Impact:Diclofenac and anticoagulants such as warfarin have a synergistic effect on bleeding. The concomitant use of diclofenac and anticoagulants have an increased risk of serious bleeding compared to the use of either drug alone.Serotonin release by platelets plays an important role in hemostasis. Case-control and cohort epidemiological studies showed that concomitant use of drugs that interfere with serotonin reuptake and an NSAID may potentiate the risk of bleeding more than an NSAID alone.Intervention:Monitor patients with concomitant use of DICLOFENAC EPOLAMINE TOPICAL PATCH 1.3% with anticoagulants (e.g., warfarin), antiplatelet agents (e.g., aspirin), selective serotonin reuptake inhibitors (SSRIs), and serotonin norepinephrine reuptake inhibitors (SNRIs) for signs of bleeding [see Warnings and Precautions (5.11)].AspirinClinical Impact:Controlled clinical studies showed that the concomitant use of NSAIDs and analgesic doses of aspirin does not produce any greater therapeutic effect than the use of NSAIDs alone. In a clinical study, the concomitant use of an NSAID and aspirin was associated with a significantly increased incidence of GI adverse reactions as compared to use of the NSAID alone [see Warnings and Precautions (5.2)].Intervention:Concomitant use of DICLOFENAC EPOLAMINE TOPICAL PATCH 1.3% and analgesic doses of aspirin is not generally recommended because of the increased risk of bleeding [see Warnings and Precautions (5.11)].DICLOFENAC EPOLAMINE TOPICAL PATCH 1.3% is not a substitute for low dose aspirin for cardiovascular protection.ACE Inhibitors, Angiotensin Receptor Blockers, and Beta-BlockersClinical Impact:NSAIDs may diminish the antihypertensive effect of angiotensin converting enzyme (ACE) inhibitors, angiotensin receptor blockers (ARBs), or beta-blockers (including propranolol).In patients who are elderly, volume-depleted (including those on diuretic therapy), or have renal impairment, co-administration of an NSAID with ACE inhibitors or ARBs may result in deterioration of renal function, including possible acute renal failure. These effects are usually reversible.Intervention:During concomitant use of DICLOFENAC EPOLAMINE TOPICAL PATCH 1.3% and ACE-inhibitors, ARBs, or beta-blockers, monitor blood pressure to ensure that the desired blood pressure is obtained. During concomitant use of DICLOFENAC EPOLAMINE TOPICAL PATCH 1.3% and ACE-inhibitors or ARBs in patients who are elderly, volume-depleted, or have impaired renal function, monitor for signs of worsening renal function [see Warnings and Precautions (5.6)].When these drugs are administered concomitantly, patients should be adequately hydrated. Assess renal function at the beginning of the concomitant treatment and periodically thereafter.DiureticsClinical Impact:Clinical studies, as well as post-marketing observations, showed that NSAIDs reduced the natriuretic effect of loop diuretics (e.g., furosemide) and thiazide diuretics in some patients. This effect has been attributed to the NSAID inhibition of renal prostaglandin synthesis.Intervention:During concomitant use of DICLOFENAC EPOLAMINE TOPICAL PATCH 1.3% with diuretics, observe patients for signs of worsening renal function, in addition to assuring diuretic efficacy including antihypertensive effects [see Warnings and Precautions (5.6)].DigoxinClinical Impact:The concomitant use of diclofenac with digoxin has been reported to increase the serum concentration and prolong the half-life of digoxin.Intervention:During concomitant use of DICLOFENAC EPOLAMINE TOPICAL PATCH 1.3% and digoxin, monitor serum digoxin levels.LithiumClinical Impact:NSAIDs have produced elevations in plasma lithium levels and reductions in renal lithium clearance. 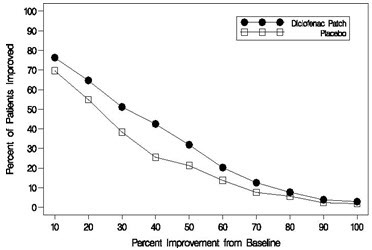 The mean minimum lithium concentration increased 15%, and the renal clearance decreased by approximately 20%. This effect has been attributed to NSAID inhibition of renal prostaglandin synthesis.Intervention:During concomitant use of DICLOFENAC EPOLAMINE TOPICAL PATCH 1.3% and lithium, monitor patients for signs of lithium toxicity.MethotrexateClinical Impact:Concomitant use of NSAIDs and methotrexate may increase the risk for methotrexate toxicity (e.g., neutropenia, thrombocytopenia, renal dysfunction).Intervention:During concomitant use of DICLOFENAC EPOLAMINE TOPICAL PATCH 1.3% and methotrexate, monitor patients for methotrexate toxicity.CyclosporineClinical Impact:Concomitant use of DICLOFENAC EPOLAMINE TOPICAL PATCH 1.3% and cyclosporine may increase cyclosporine's nephrotoxicity.Intervention:During concomitant use of DICLOFENAC EPOLAMINE TOPICAL PATCH 1.3% and cyclosporine, monitor patients for signs of worsening renal function.NSAIDs and SalicylatesClinical Impact:Concomitant use of diclofenac with other NSAIDs or salicylates (e.g., diflunisal, salsalate) increases the risk of GI toxicity, with little or no increase in efficacy [see Warnings and Precautions (5.2)].Intervention:The concomitant use of diclofenac with other NSAIDs or salicylates is not recommended.PemetrexedClinical Impact:Concomitant use of DICLOFENAC EPOLAMINE TOPICAL PATCH 1.3% and pemetrexed may increase the risk of pemetrexed-associated myelosuppression, renal, and GI toxicity (see the pemetrexed prescribing information).Intervention:During concomitant use of DICLOFENAC EPOLAMINE TOPICAL PATCH 1.3% and pemetrexed, in patients with renal impairment whose creatinine clearance ranges from 45 to 79 mL/min, monitor for myelosuppression, renal and GI toxicity.NSAIDs with short elimination half-lives (e.g., diclofenac, indomethacin) should be avoided for a period of two days before, the day of, and two days following administration of pemetrexed.In the absence of data regarding potential interaction between pemetrexed and NSAIDs with longer half-lives (e.g., meloxicam, nabumetone), patients taking these NSAIDs should interrupt dosing for at least five days before, the day of, and two days following pemetrexed administration. The DICLOFENAC EPOLAMINE TOPICAL PATCH 1.3% is supplied in resealable envelopes, each containing 5 patches (10 cm × 14 cm), with 6 envelopes per box (NDC 0093-3225-55). Each individual patch is embossed with " DICLOFENAC EPOLAMINE TOPICAL PATCH 1.3% TEVA 3225". Each patch contains 180 mg of diclofenac epolamine in an aqueous base (13 mg of active per gram of adhesive or 1.3%).The product is intended for topical use only.Keep out of reach of children and pets.Envelopes should be sealed at all times when not in use.Curad® Hold Tite™ is a trademark of Medline Industries, Inc., and Surgilast® Tubular Elastic Dressing is a trademark of Derma Sciences, Inc. Manufactured for: IBSA Institut Biochimique SA, CH-6903 Lugano, SwitzerlandDistributed byTeva Pharmaceuticals USA, Inc., North Wales, PA 19454 (USA)For more information call 1-866-832-8537This Medication Guide has been approved by the U.S. Food and Drug Administration.Revised:August, 2018Medication Guide for Nonsteroidal Anti-inflammatory Drugs (NSAIDs)What is the most important information I should know about medicines called Nonsteroidal Anti- inflammatory Drugs (NSAIDs)?NSAIDs can cause serious side effects, including:Increased risk of a heart attack or stroke that can lead to death. This risk may happen early in treatment and may increase:with increasing doses of NSAIDswith longer use of NSAIDsDo not take NSAIDs right before or after a heart surgery called a "coronary artery bypass graft (CABG)." Avoid taking NSAIDs after a recent heart attack, unless your healthcare provider tells you to. You may have an increased risk of another heart attack if you take NSAIDs after a recent heart attack.Increased risk of bleeding, ulcers, and tears (perforation) of the esophagus (tube leading from the mouth to the stomach), stomach and intestines:anytime during usewithout warning symptomsthat may cause deathThe risk of getting an ulcer or bleeding increases with:past history of stomach ulcers, or stomach or intestinal bleeding with use of NSAIDstaking medicines called "corticosteroids", "anticoagulants", "SSRIs", or "SNRIs"increasing doses of NSAIDslonger use of NSAIDssmokingdrinking alcohololder agepoor healthadvanced liver diseasebleeding problemsNSAIDs should only be used:exactly as prescribedat the lowest dose possible for your treatmentfor the shortest time neededWhat are NSAIDs?NSAIDs are used to treat pain and redness, swelling, and heat (inflammation) from medical conditions such as different types of arthritis, menstrual cramps, and other types of short-term pain.Who should not take NSAIDs?Do not take NSAIDs:if you have had an asthma attack, hives, or other allergic reaction with aspirin or any other NSAIDs.right before or after heart bypass surgery.Before taking NSAIDS, tell your healthcare provider about all of your medical conditions, including if you:have liver or kidney problemshave high blood pressurehave asthmaare pregnant or plan to become pregnant. Talk to your healthcare provider if you are considering taking NSAIDs during pregnancy. You should not take NSAIDs after 29 weeks of pregnancy.are breastfeeding or plan to breast feed.Tell your healthcare provider about all of the medicines you take, including prescription or over-the- counter medicines, vitamins or herbal supplements. NSAIDs and some other medicines can interact with each other and cause serious side effects. Do not start taking any new medicine without talking to your healthcare provider first.What are the possible side effects of NSAIDs?NSAIDs can cause serious side effects, including:See "What is the most important information I should know about medicines called Nonsteroidal Anti- inflammatory Drugs (NSAIDs)?new or worse high blood pressureheart failureliver problems including liver failurekidney problems including kidney failurelow red blood cells (anemia)life-threatening skin reactionslife-threatening allergic reactionsOther side effects of NSAIDs include: stomach pain, constipation, diarrhea, gas, heartburn, nausea, vomiting, and dizziness.Get emergency help right away if you get any of the following symptoms:shortness of breath or trouble breathingchest painweakness in one part or side of your bodyslurred speechswelling of the face or throatStop taking your NSAID and call your healthcare provider right away if you get any of the following symptoms:nauseamore tired or weaker than usualdiarrheaitchingyour skin or eyes look yellowindigestion or stomach painflu-like symptomsvomit bloodthere is blood in your bowel movement or it is black and sticky like tarunusual weight gainskin rash or blisters with feverswelling of the arms, legs, hands and feetIf you take too much of your NSAID, call your healthcare provider or get medical help right away. These are not all the possible side effects of NSAIDs. For more information, ask your healthcare provider or pharmacist about NSAIDs.Call your doctor for medical advice about side effects. You may report side effects to FDA at 1-800-FDA-1088.Other information about NSAIDsAspirin is an NSAID but it does not increase the chance of a heart attack. Aspirin can cause bleeding in the brain, stomach, and intestines. Aspirin can also cause ulcers in the stomach and intestines.Some NSAIDs are sold in lower doses without a prescription (over-the counter). Talk to your healthcare provider before using over-the-counter NSAIDs for more than 10 days.General information about the safe and effective use of NSAIDsMedicines are sometimes prescribed for purposes other than those listed in a Medication Guide. Do not use NSAIDs for a condition for which it was not prescribed. Do not give NSAIDs to other people, even if they have the same symptoms that you have. It may harm them.If you would like more information about NSAIDs, talk with your healthcare provider. You can ask your pharmacist or healthcare provider for information about NSAIDs that is written for health professionals.